Abstract: Extensive empirical and theoretical research has focused on understanding the diversity of reproductive patterns and behavioral interactions observed in nature. I have argued that considering both coevolutionary dynamics and social interactions can improve our ability to explain and predict this striking variation. In my talk, I will discuss why these dynamics are essential for understanding the evolution of male and female reproductive traits. 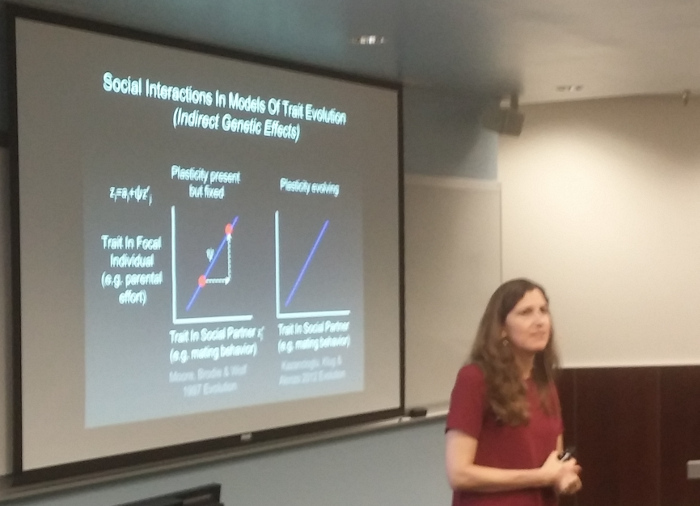 I will first present the results of some general theory examining how social interactions affect evolutionary dynamics and discuss extensions of this theory to our understanding of specific reproductive behaviors. I will then present some data on how interactions between the sexes at mating and fertilization affect sexual selection, potentially driving the evolution of sperm allocation and paternal care in a Mediterranean fish (the ocellated wrasse, Symphodus ocellatus). Finally, I will discuss what these and other similar empirical patterns have to say about what theory and data are needed if we wish to improve our understanding of and capacity to predict the diversity of reproductive patterns observed in nature. Suzanne Alonzo is a professor in the Department of Ecology and Evolutionary Biology at the University of California, Santa Cruz. Her research uses a combination of theory and empirical work on fishes to understand how interactions within and between the sexes affect the evolution of traits related to reproduction. Her research has focused on variety of topics including alternative reproductive tactics, sperm competition, sexual conflict parental care and female choice. Alonzo received a B.A. from the University of California, Berkeley in 1992 and a Ph.D. from the University of California, Santa Barbara in 1998.